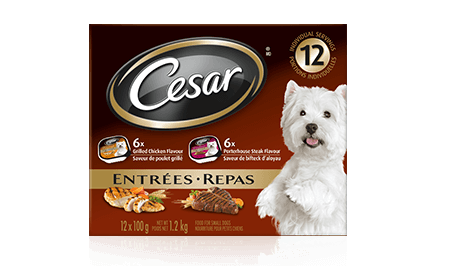 CESAR® ENTRÉES: 6 GRILLED CHICKEN FLAVOUR & 6 PORTERHOUSE STEAK FLAVOUR 12x100g is rated 4.7 out of 5 by 58. Rated 5 out of 5 by WENDY_FON_365683610 from Cesar Entrees are definitely a hit with Dusty! He absolutely loved both of them. The easy open tins are great. The quantity of the grilled chicken and porterhouse steak in each tin is the perfect portion size! Both were nice and moist. The texture was perfect for easy eating. No big clumps that you need to break up for easier eating. Upon opening the tin of either grilled chicken or porterhouse steak sent Dusty into his happy dance and I swear if he could smile it would have been big!! I highly recommend Cesar Entrees as a good quality wet dog food for small dogs. Rated 5 out of 5 by JOANNEWMB_365685814 from First of all THANK YOU VERY MUCH FOR THIS OPPORTUNITY IT WAS MUCH APPRECIATED. You now will have another life long loyal customer. My little one is just crazy for it and now every time I go to the fridge for anything she thinks it is for some of her Cesar treat and her head is right there in the fridge looking up at the shelf were it is kept. I did give one to my neighbors and there little one loved it as well. The package recommends up to four per day and we do think that would be too costly but at one per day divided up will work for the budget just fine. Rated 5 out of 5 by JANETKMB_365679828 from My dog LOVED this product, she was asking for more after every meal - she probably could've eaten all 12 trays in about two sittings (she has a big appetite for a small dog!). I found the plastic tray holding all the food trays very useful for keeping everything tidy on my counter - it kept all the trays neatly in place and allowed me to easily see how many were left etc. Not sure if it's really meant for that purpose but it's certainly a bonus. Overall, a great product and I would definitely recommend! Rated 5 out of 5 by MARGEHON_365523404 from What a great product ! Loved by my pet . Seeing the containers makes him all excited. He enjoyed the grilled chicken as much as the porter house steak. Used to table food i was so surprised that he instantly liked these . I am so happy with your very generous offer . So much easier to take on a vacation. Your smart container being the serving dish ! Already bought more . Thank you ! Rated 4 out of 5 by ALICIAMAB_365676937 from I liked how it didn't upset my dogs tummy subbing this soft food for her other one for a while! I did mix it with a bit of her hard food. My dog is a Cairn Terrier and Chihuahua mix, She loved it and would whimper while I prepared her food because she was so excited. I would probably buy this again knowing it's a hit and that it works well with her digestion. Rated 5 out of 5 by MARGARETBAB_365663240 from My dog loved Cesar Entrees, both the Grilled Chicken and Porterhouse Steak Flavors. I have never seen her this excited at her feeding time before. She quite literally smacked her lips and licked my hand to say way to go Mom, you are the best. Entrees look appetizing and appealing. Would highly recommend this product. Rated 4 out of 5 by GEORGEPON_365652014 from My dogs enjoyed this very much. I also mixed this with Caesars kibble because one serving isn't enough for my eternally hungry little canines. They also liked the kibble mixed in with the wet food. I always buy this when we take weekend getaways because I know they will eat it unlike other types of canned food. Rated 5 out of 5 by TANICESAB_365675742 from My dog prefers this wet dog food over any dry food. When I pull out the container she comes running and even the cat try's to get some. The only bad thing about this and any wet dog food is the smell is awful. Over all a good experience for myself and my dog and I will be buying again. CESAR® Entrées Grilled Chicken Flavour Food For Small Dogs is formulated to meet the nutritional levels established by the AAFCO Dog Food Nutrient Profiles for maintenance. CESAR® Entrées Porterhouse Steak Flavour Food For Small Dogs is formulated to meet the nutritional levels established by the AAFCO Dog Food Nutrient Profiles for maintenance. Grilled chicken: MEAT BY-PRODUCTS, LIVER, CHICKEN, CHICKEN BY-PRODUCTS, MINERALS AND VITAMINS, GUMS, COLOURS, DRIED YAM, NATURAL FLAVOURS, GRILLED CHICKEN FLAVOUR, SODIUM NITRITE (FOR COLOUR RETENTION), WATER SUFFICIENT FOR PROCESSING. Porterhouse Steak: MEAT BY-PRODUCTS, LIVER, BEEF, CHICKEN, CHICKEN BY-PRODUCTS, MINERALS AND VITAMINS, COLOUR, GUMS, DRIED YAM, NATURAL FLAVOURS, PORTERHOUSE STEAK FLAVOUR, SODIUM NITRITE (FOR COLOUR RETENTION), WATER SUFFICIENT FOR PROCESSING.